I hope you have entered in my Giveaway for this month. If not there is still time. In fact, you have exactly 10 days left to leave your comment on this post here. IT IS THE ONLY WAY to enter. Leaving a comment on Facebook will not work. It often breaks my heart to see how people won't read the directions and think they have entered in the drawing when in fact they have not. 1. YOU MUST LEAVE A COMMENT or two or three or more to increase your chances. 2. YOU MUST LEAVE ME AN EMAIL ADRESS OR SOME WAY THAT I CAN EASILY CONTACT YOU. What could $50 get you at my shop? Well check out this little cutey pie I have added to my shop. 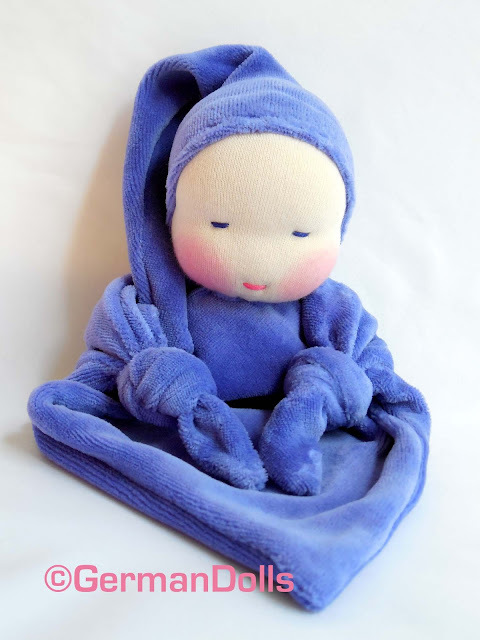 I just restocked my beloved waldorf style blanket dolls. They are $35 a piece. You could get one of them. I think this type doll is such a fun way to introduce people to the world of Waldorf style dolls. They are so simple and gorgeous. $50 could buy you a little blanket sweety plus one of my little minis who range around $15. So don't tarry and enter now! I just love your dolls, particularly the little ones. We gave one of your dolls to my son's teacher at her class baby shower.